Arden Graber bought Graber’s Carpet Studio from his cousin in 1993. Ever since then he and his family have worked hard to provide their customers with quality flooring, installation and the knowledge they need to maintain it. Arden’s 35 years of flooring installation experience has enabled him to train his sons in quality installation and product knowledge. Along with his wife, who has a passion for helping customers find the floor covering product that fits their lifestyle, the Graber family is a team that is different than most. In 2006 the Graber’s decided to change the business name to Graber’s Flooring Studio to better reflect the many products that they provide. For outstanding service to the Nappanee community the Nappanee Area Chamber of Commerce awarded the Graber’s Retailer of the Year for 2002. 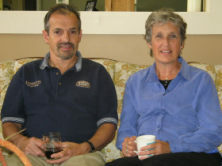 They were also awarded Retailer of the Year in 2007 & 2010 by Ohio Valley Flooring. Come in and experience the Graber Difference for yourself.